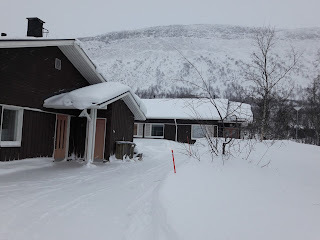 The Kilpisjärvi biological station in winter is a nice place for a stay. It is not busy at all, but still you meet some other researchers to discuss new ideas. It is well equipped (with stuff like sleighs, snow shoes and ski) and has an own cantine that serves breakfast and dinner. We had nice food here including the very local reindeer meat dish. The station is famous for the research on lemmings. They are part of the logo, you can read an article in the hallway and look at (touch?) some lemming fur. We forgot to take daytime pictures with our all-sky fisheye lens camera - so we take a walk down to the lake. If one wants to evaluate the impact of light pollution on lakes (or other ecosystems) it is required to put it in context with natural nocturnal but also with daylight. Daylight is supposed to be a lot. If you look into a text book it is 100 000 lx or a bit more....well here in the sub-arctics (Kilpisjärvi is at about 69° N) just 1 month after winter solstice it peaks at around 600 lx on a cloudy "day" (that is less then the textbook value at sunset of around 800lx). Todays task is to measure the light on the lake and under the ice. 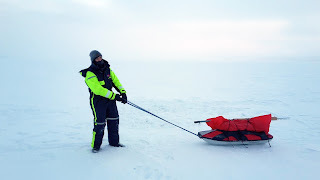 So Franz and I jump back into our cool explorer suits and pull the seldge with the equipment onto the lake, where the snowmobile is waiting for a fun ride. When outside, we are amazed by the view above Kilpisjärvi village. 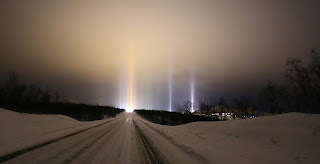 The ice fog creates "light pillars" a phenomenon where flat ice crystals float in the lower atmosphere and create some sort of giant mirror reflecting only the light emitted directly upwards towards your observation point (see wikipedia here and nicer pictures on twitter). These pillars look bizarrely and the most spectacular thing is that every car approaching us is creating the same moving "light pillar"....pretty stunning. In the morning we meet our IGB colleague Georgiy and his team consting of two Russians from Irkutsk: Konstantin and Ilja and Joonathan from Finland. They are all lake physicists interested in the dynamics of the water under the ice.